Cooking at home for fun, health and frugality! I have seen slow cooker chicken Caesar sandwich recipes floating around Pinterest and blogs. It looked tasty to Hagbard and me for a quick dinner or lunch. Amethesto does not want to try it at all so she is having a plain chicken sandwich. Basically you will need some cooked chicken to start with. You can slow cook the chicken like they do in the other recipes but if you don’t have a slow cooker you could also just boil/bake some chicken, use leftover chicken or buy a precooked chicken from the deli and use that. I’m going to give you the ingredient list for my faster version with one sandwich. I added a bit less parmesan cheese and dressing to my mixture than the other recipes would have you do because I am watching calories. I used baby spinach instead of romaine lettuce for more of a nutritional punch. I had it all on a warm crusty ciabatta roll. Mix chicken, salad dressing, parmesan cheese, parsley and pepper. Heat in pan on stove over medium heat for 10-15 minutes. Stir occasionally. Put mixture on bun with lettuce or baby spinach. Verdict: This is a keeper! Hagbard is back to the grindstone of work and school today. I got up early to pack his lunch in a laptop lunches box. Today’s lunch is ravioli with tomato & basil sauce, Caprese salad, broccoli filler, dried fruit and a granola bar (cut into squares to fit). I think we got the laptop lunches box in January. I really like using it because there is less waste and the separate inner containers make it easy to pack a more interesting and complete meal. Around the time we purchased this box, I really started looking at making bentos. 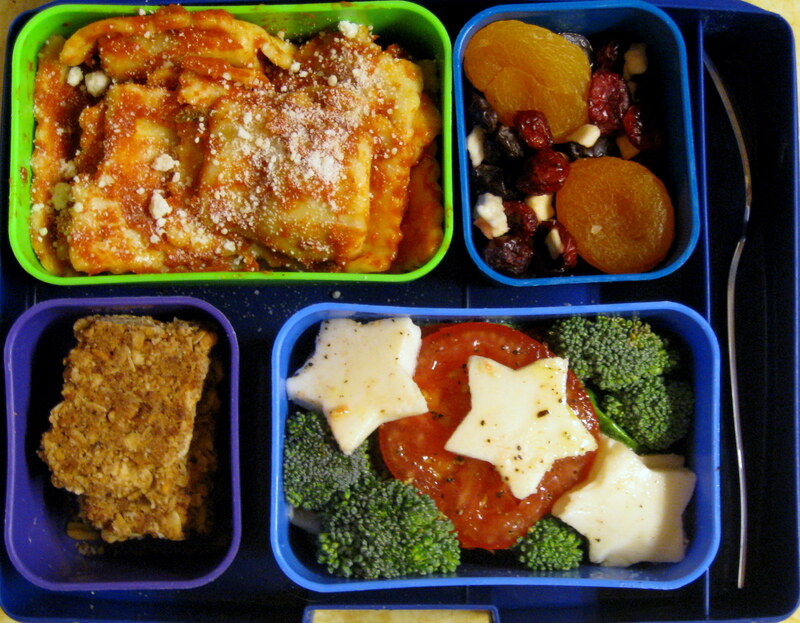 There are some wonderful ideas out there to make a packed lunch appetizing and healthy. I got a book Kawaii Bento Boxes: Cute and Convenient Japanese Meals on the Go at the same time that I got the lunch box. In the book there are instructions for making things like a rolled omelet or rice balls. There is also good information on how to pack your bento and nutritionally balance it. And of course there are ideas for making it cute! I was a bit surprised at how much ketchup was used. I’m not really a ketchup fan- I don’t even dip my fries in it- so I shuddered a bit every time it was mentioned but wondered if Japanese ketchup is different. Hagbard doesn’t mind cute lunches but I don’t go overboard usually. I think even just using a cookie cutter on a sandwich adds appeal to ordinary lunch. Generally I spend 10- 20 minutes packing the lunch and making coffee. The most time I have ever spent putting together a lunch was probably an hour. That included cooking rice or pasta and fiddling with the box. I think having a plan before you start and having a stash of things that are ready to tuck into the box definitely cuts down on prep time. I frequently incorporate planned leftovers and that saves time.